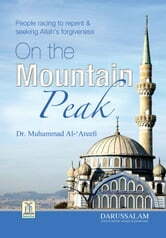 “On the Mountain Peak” is a book written by the acclaimed Muslim writer and scholar Shaykh Dr. Muhammad ‘Abd Ar-Rahman Al-‘Arifi. Who are the wealthiest people in the world? This is the question posed by the author in this insightful and thought-provoking study of the behavior and example of the prophets, the righteous predecessors and people living today. Backed by evidence from the Qur'an and the Sunnah, the author provides a definitive answer: The rich among us are those who believe in Allah, are kind to their relatives, and promote good and forbid evil. The author also explains the types of evil, and how to take action against it. The author has concluded this book to be easy to read and comprehensive, hoping that it will enable the Muslims to be well informed about matters concerning good and evil which will in turn strengthen their faith.